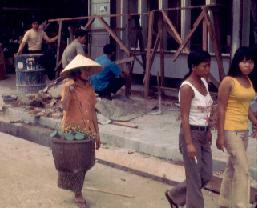 From the summer of 1973 till the summer of 1974 we lived in the little town of Nakon Phanom, Thailand, better known to those who lived there as NKP. Although a small village of around 3000, there was plenty to do. Several movie theaters, an abundance of restaurants, and around 30 bars made entertainment easy to find. Add to that the beautiful scenery and friendly people, and you can see why we enjoyed ourselves. Here is but a taste of what it looked like along with some black & white shots. 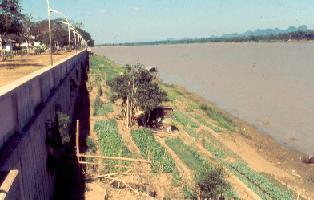 The Mekong River at NKP during dry season. 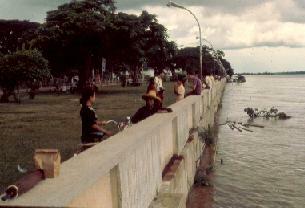 The same place on the Mekong during the rainy season. 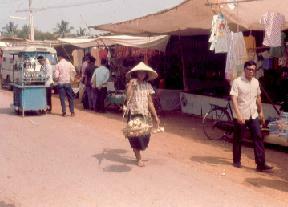 Typical street scenes with basket carrier in straw hat. Contrast between traditional and "modern" girls with western clothes and cigaretts. 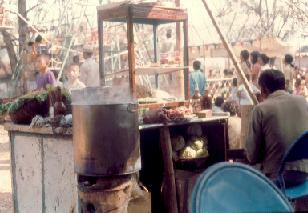 A Thai soup stand with the stock pot on the left, which contains the vegetables and spices. The noodles and meat,either beef or water buffalo, are quick cooked in this broth with a small basket and then placed in a bowl with a scoop of broth. We also took several side trips around the NKP area, with one of our favorites being the temple of Thatphanom.